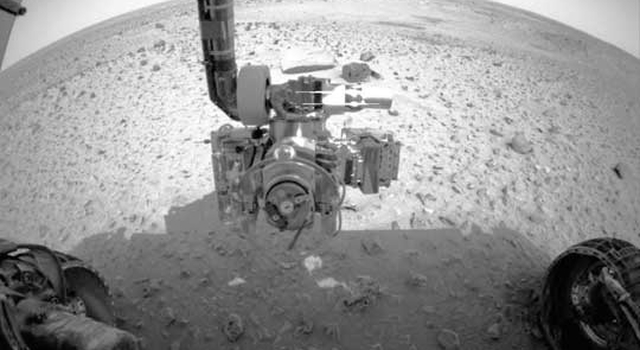 The robot's first picture looking back at the now-empty lander and showing wheel tracks in the soil set off cheers from the robot's flight team at NASA's Jet Propulsion Laboratory, Pasadena, Calif.
"Spirit is now ready to start its mission of exploration and discovery. We have six wheels in the dirt," said JPL Director Dr. Charles Elachi. Since Spirit landed inside Mars' Gusev Crater on Jan. 3 (PST and EST; Jan. 4 Universal Time), JPL engineers have put it through a careful sequence of unfolding, standing up, checking its surroundings and other steps leading up to today's drive-off. "It has taken an incredible effort by an incredible group of people," said Mars Exploration Rover Project Manager Peter Theisinger of JPL. The drive moved Spirit 3 meters (10 feet) in 78 seconds, ending with the back of the rover about 80 centimeters (2.6 feet) away from the foot of the egress ramp, said JPL's Joel Krajewski, leader of the team that developed the sequence of events from landing to drive- off. The flight time sent the command for the drive-off at 12:21 a.m. PST today and received data confirming the event at 1:53 a.m. PST. The data showed that the rover completed the drive-off at 08:41 Universal Time (12:41 a.m. PST). "There was a great sigh of relief from me," said JPL's Kevin Burke, lead mechanical engineer for the drive-off. "We are now on the surface of Mars." With the rover on the ground, an international team of scientists assembled at JPL will be making daily decisions about how to use the rover for examining rocks, soils and atmosphere with a suite of scientific instruments onboard. 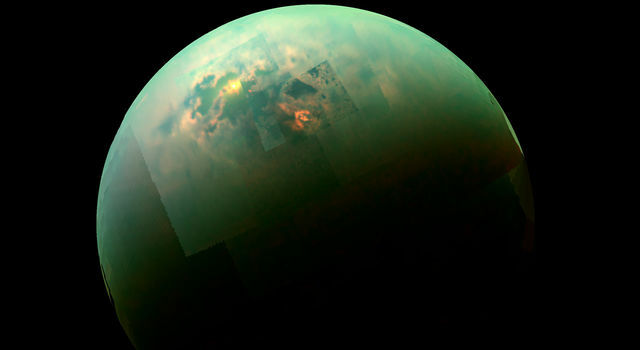 "Now, we are the mission that we all envisioned three-and-a-half years ago, and that's tremendously exciting," said JPL's Jennifer Trosper, mission manager. 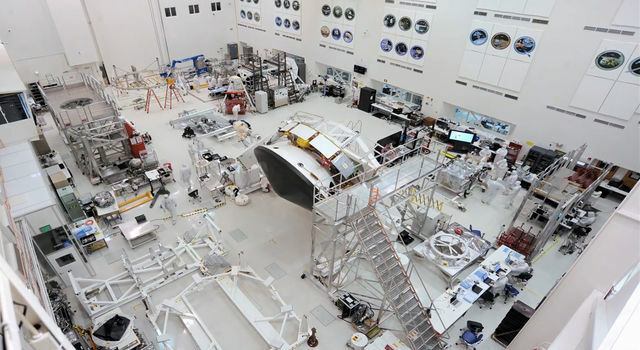 JPL engineer Chris Lewicki, flight director, said "It's as if we get to drive a nice sports car, but in the end we're just the valets who bring it around to the front and give the keys to the science team." Spirit was launched from Cape Canaveral Air Force Station, Fla., on June 10, 2003. 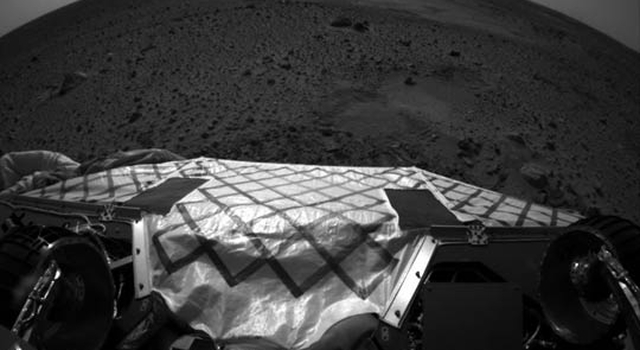 Now that it is on Mars, its task is to spend the rest of its mission exploring for clues in rocks and soil about whether the past environment in Gusev Crater was ever watery and suitable to sustain life. Spirit's twin Mars Exploration Rover, Opportunity, will reach Mars on Jan. 25 (EST and Universal Time; 9:05 p.m., Jan. 24, PST) to begin a similar examination of a site on the opposite side of the planet.